Being a baker, the Nestle Toll House Cookie holds a very special place in my heart. In my journey towards baking the perfectly chewy chocolate-chip cookie, the original Nestle Toll House Cookie has lent me tons of inspiration. Needless to say, the cookie holds unparalleled historical importance. Flash forward to last night. After about a month of deciding to visit the Cafe and then changing our plans due to one reason or another, the boyfriend and I finally reached the doorstep of Nestle Toll House Cafe by Chip, Muscat. My, was I excited! I could barely contain myself. The Cafe is super elegant. Playing with hues of yellow and black, the decor is chic and contemporary. It’s the kind of place you would like to hang out with your friends at or chill by yourself with a good book, a cup of coffee and a delicious slice of cake or cookie. 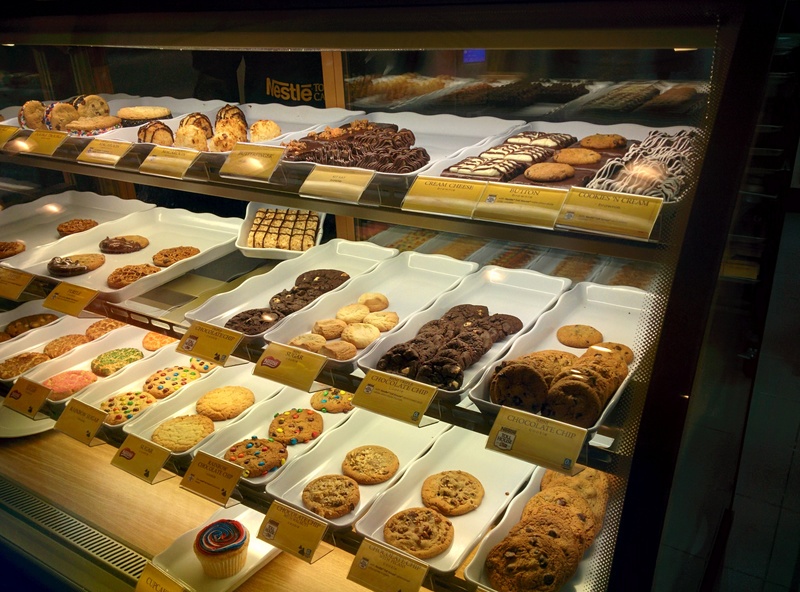 But since we wanted to head home at the earliest, we decided to take some baked goodies to go. We browsed through an array of Cookies (Classic Chocolate-Chip, Triple Chocolate-Chip, Rainbow Chocolate-Chip, Sugar Cookies, Chocolate-Chip with walnuts and others with pecans), Brownies (Cookies ‘n’ Cream, KitKat, Button, Butterfinger and Cream Cheese), Coconut Macaroons and Cookie Sandwiches. 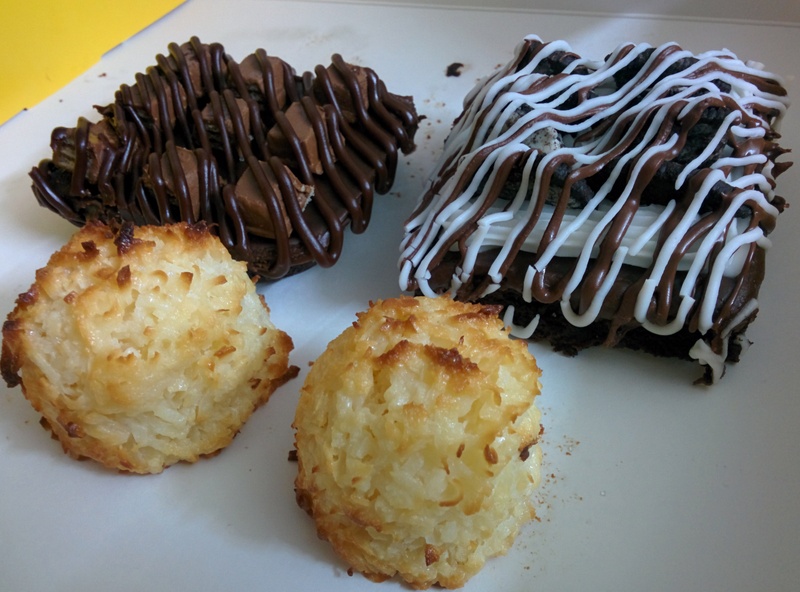 The boyfriend settled on the KitKat Brownie while I chose to have the Cookies ‘n’ Cream one and we decided to take two Coconut Macaroons for the parents. When the cashier handed us the bill, we were shocked – two brownies and two little macaroons cost us RO 6.400 in total! (That’s RO 1.400 per macaroon and RO 1.800 per brownie.) At this point I would like for you to know that none of the prices are mentioned on the name tags of each goody. I have to admit that I found the goodies steeply overpriced. Knowing what goes into baking brownies and selling them, I just couldn’t fathom why the brownies cost so much more than they should have. And coconut macaroons of that puny size are simply not worth RO 1.200! As we walked out of the cafe, we only hoped that each goody tasted so good that the hole in our pockets would seem less deep. Sadly, this was not the case. The brownies were way too cakey, sickly sweet owing to the added toppings and the base brownie itself felt like the ones made with a store-bought mix. Nothing special or wow-worthy. 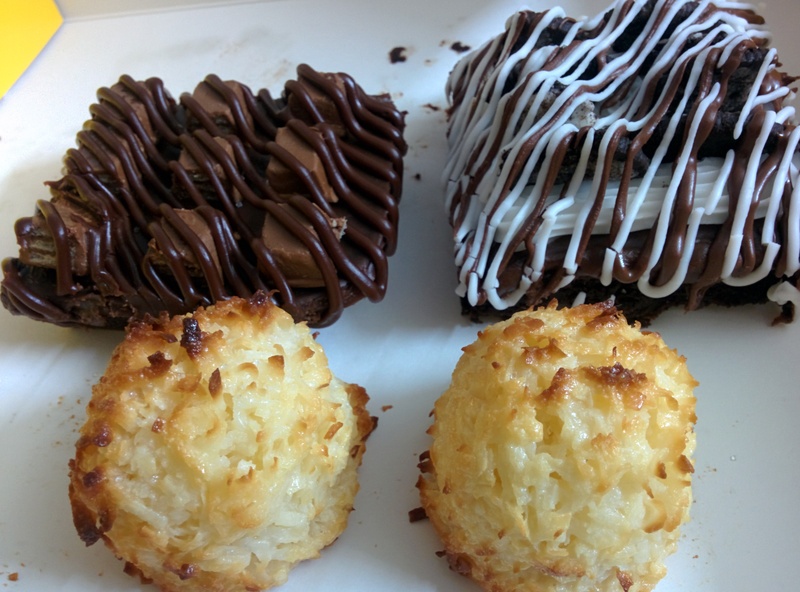 The coconut macaroons were too sweet and lacked the crispy crunch that macaroons normally have. All in all, a huge disappointment. 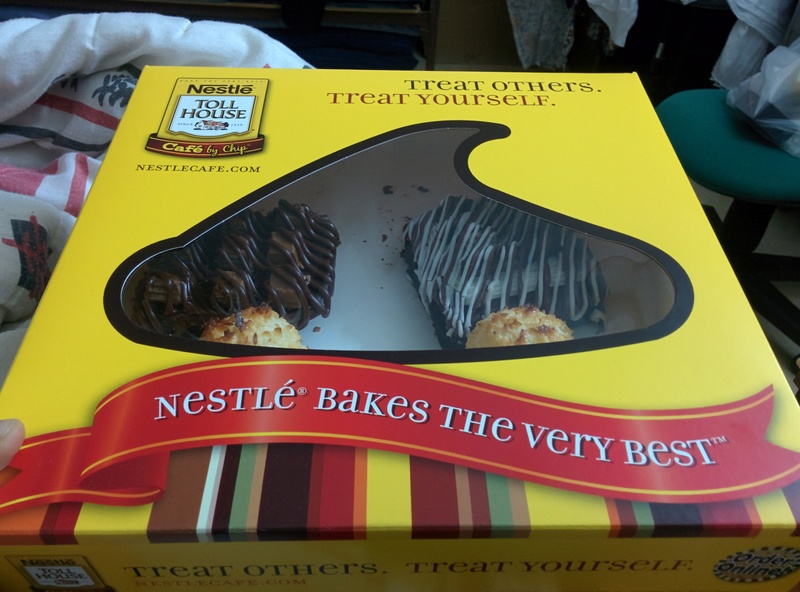 The Nestle Toll House Cafe by Chip holds a long-standing reputation for being one of the greatest confectioneries in the world producing some absolutely lip-smacking delicacies. 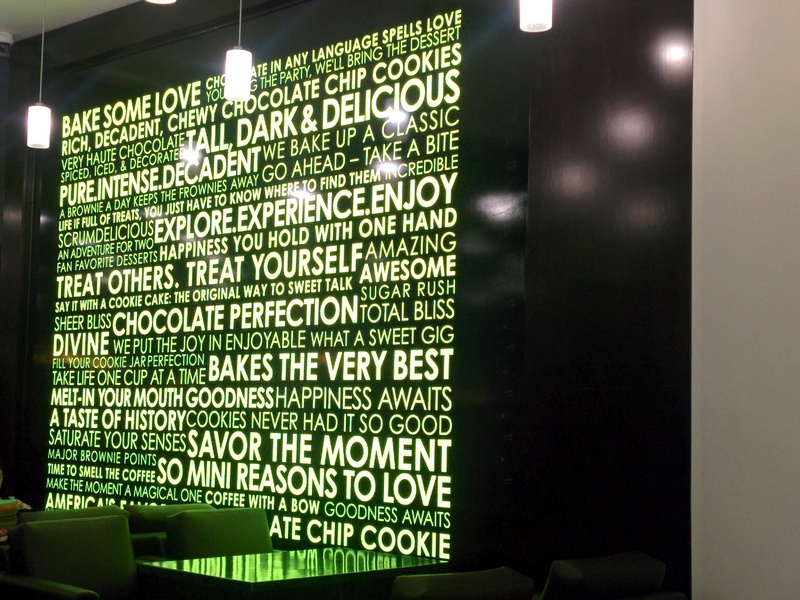 I really hope the branch in Muscat does step up to the international standards and that soon we’ll have scrumptious goodies that are of complete value for our money served up at the Nestle Toll House Cafe by Chip, Muscat. There is room for a lot of improvement, and being a dessert-freak myself, I certainly hope to see some soon!